Today, we're pleased to present a Guest Blog from CE art alum Seth Teter. 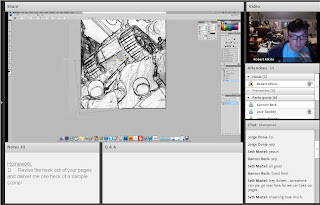 Seth shares his thoughts on Comics Experience courses, the Workshop community, and provides a cool example of how the artwork for a story progressed during the course of a class. 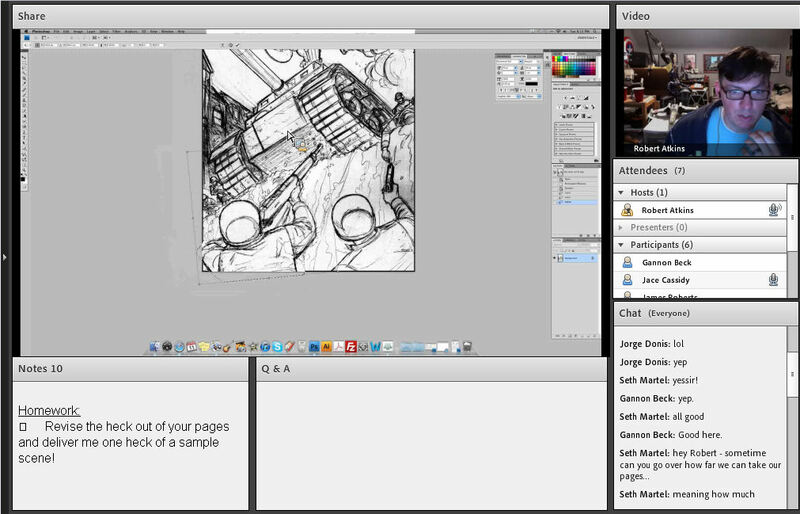 I have been taking online classes from Comics Experience for a couple of years now. This past October, I went to the New York Comic Con to meet my instructors and fellow classmates from CE. I was often asked, "What do you do? Do you want to be a pro? Why do you take these classes? What do you want from all of this?" I sheepishly answered that I am just taking classes at CE to learn. To grow. I have learned so much from CE that I can never put into words how much I love the online world that Andy and company have created for people like me. The first comic book I ever bought gob smacked me from the second I opened it. My senses were overwhelmed in pulpy goodness. The experience of that comic book was enough to hook me for life. 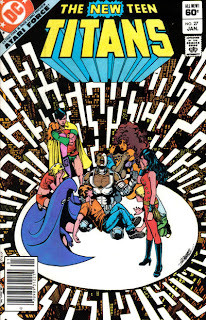 It was New Teen Titans #27. What a life changer! Like many fanboys I grew up wanting to become a comic creator. Rejections to art schools led me down a different path from my one true love of comic books. I took a stab at acting as I had more natural talent in that direction. For over a decade I did theatre all over the country. I loved it...for a while. It wasn't my one true love. 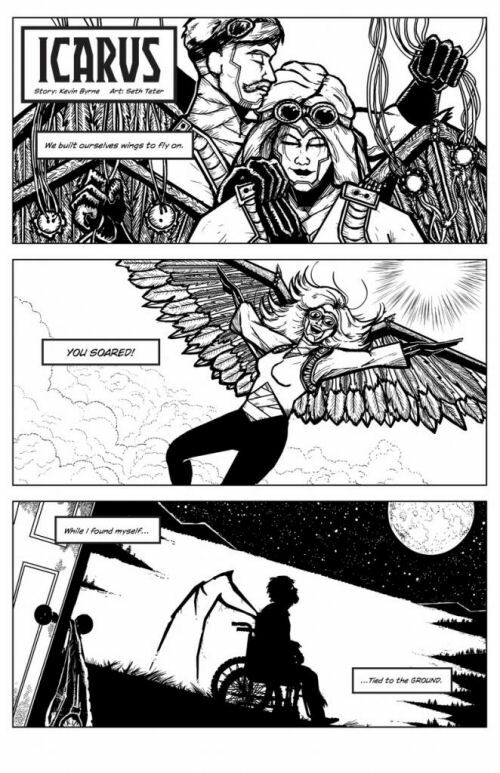 So I tried again to become a comic book creator. I applied to art schools and faced more rejection. I didn't sit around and cry. I became a teacher. Not an art teacher. I became a special education teacher. Even though it isn't what I thought I would do with my life, I love my current job because I help children with learning disabilities grow into the best possible versions of them they can be. I am happy in my current path. I love my job. Yet...I still have the urge to create comics. So where do I set my fanboy passion on fire? Where do I learn from the best of the best? Comics Experience! I have taken many classes from CE. In each class I have struggled, and in each class I have grown leaps and bounds. There is so much involved in creating comics. First and foremost it is about storytelling. I see a big difference in how I approach the work and laying out panels from where I was before CE to where I am now. If anything, I think I have become a competent storyteller and I've really learned how to place information to tell a good story. One experience in CE that really stood out for me was an assignment from Introduction to Comic Book Art with Robert Atkins. 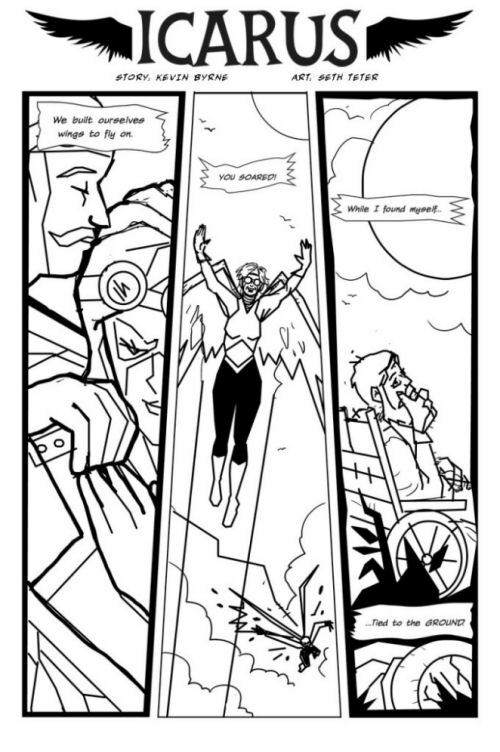 I took part in an exercise where I illustrated a one-page story with a writer's script from the Creators Workshop. In the Workshop forums, writers had written one-page scripts in the monthly writing challenge. For my class assignment, I used one of the scripts written by a CE workshop member, Kevin Byrne. This project was the best experience I could ever ask for, as it really turned into a collaborative process between me, Kevin, members of the CE forums, and several critiques from Robert Atkins and pro-contributor, Sean Chen. I learned more than I ever thought possible. Here is a visual progression of where the project started and how it ended. My love for CE is boundless. Where else can an artist like me learn and grow in an environment where there is so much support and nurturing? Every instructor, guest lecturer, and fellow classmate has been supportive and encouraging. Because of this amazing learning environment I have been living out a dream come true and learning more than I ever thought possible. I can't recommend the classes and the workshop enough. CE offers a world of learning, growing, and sharing for anyone and everyone. For fanboys like me, for pros, for anyone. Comics Experience is a wonderful place to grow wherever you are in your comics journey in a creative and collaborative wonderland.